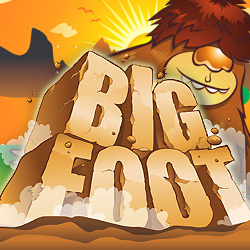 Big Foot Scratch is an exciting online gambling game, based around the creature of Bigfoot. For those of you who not know, Bigfoot is a legend who is has gone down in history – a huge outsized beast that is covered in hair and makes grunts that could crack concrete! There is much well documented literature and even a film or two about the story behind the strong and somewhat friendly beast. This game has a special element that is not found regularly online and that is that is has been cleverley adapted into a scratch card game. There is also no need to have much fear about Bigfoot because he offers a very friendly payout, being the highest paying symbol of the game. The game has been developed to be straightforward which makes it attractive to all abilities – even if you have limited experience of playing games online. NextGen are based in Sydney, Australia. The Australian developers have created speciality games incorporating high quality and inviting graphics since the 1990s. In this time they have worked hard to create games that are up to date with modern technology. Thus, giving them a competitive edge through being one of the first developers to work with gaming that is compatible with mobile devices. NextGen now belong to the NYX gaming group. Their impressive portfolio includes over some of the most well known mobile scratch and slot games in the market! You will play this game over 4 cards and it is very simple to start playing – you just hit the hard to miss play button. It is then up to your patience whether you reveal all the cards or scratch them off individually – for that added suspense! If there are 3 matching symbols on a single card this will result in a multiplier of up to 1,000x. Set your bet accordingly – its worth knowing that you can win more one prize per card!Prizes of up 1,000 times your bet can be awarded for the warning sign, the owl, the campfire, the nature reserve, the rambler, the footprint, and Big Foot himself. This is a really engaging and simple to use scratch card game. It stands out by there being an increased chance of winning prizes due to every game including four cards! It is the ideal game to play on your mobile whilst travelling or wanting to kill some time on a break. But, if you prefer to sit back and get stuck in do not be afraid because the graphics are highly entertaining and will allow you to get lost in a world where Bigfoot storms around. The background sees a national park with a majestic sun rising elegantly through the forest trees. Then you will see Bigfoot himself, engulfed around his iconic footprints. There are not a lot of complex bonius rounds to learn for this game, it is more a what you get is what you get. That said, what you get is a fun scratch card game which gives you the chance to win some great money – quickly and easily!